Joanne Jacobson, professor of English at Yeshiva College, called 'The Goldbergs' "a shared media experience for an older generation of American Jews." Apr 24, 2006 — The more than 225 people at the sold-out program, “The Legacy of The Goldbergs,” came to the Center for Jewish History March 23 to visit their favorite, and oldest, Jewish mother—Molly Goldberg, the central character of the radio and TV show The Goldbergs, which ran from 1929 to 1956. The event, sponsored by Yeshiva College and the American Jewish Historical Society, brought Molly back to life for the audience, most of whom grew up with her. Actress Gertrude Berg invented and played the character of Molly, wrote most of the more than 5,000 episodes, and produced the sitcom. 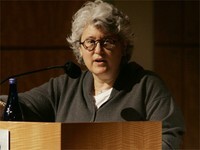 She capitalized on the Molly Goldberg phenomenon with short stories, stage plays, a feature film, and even a cookbook. “She was a pioneer in product placements, even before Johnny Carson,” said filmmaker Aviva Kempner, who showed a clip of a documentary she is making about the life of Ms. Berg. “The Legacy of The Goldbergs” included screenings of old TV episodes and a reenactment of a radio episode by a cast of actors. Academics—including Joanne Jacobson, PhD, professor of English at Yeshiva College—weighed in on the significance of the show in American popular culture, discussing topics such as Jewish assimilation, life in the suburbs, and the Jewish mother. Molly’s legacy was brought fittingly back to life at the conclusion of the program, when guests were greeted with plates laden with gefilte fish and smoked salmon sandwiches, made from The Molly Goldberg Jewish Cookbook. The event commemorated the 50th anniversary of the program’s finale and was cosponsored by the Yeshiva University Museum, the Jewish Museum, and the Jewish Women’s Archive.